Happy 2018 Everyone! It is practically half way through January, how can this be? Today marks my first post of the year, yes I could do a nice healthy number but the chocolate has won me over. 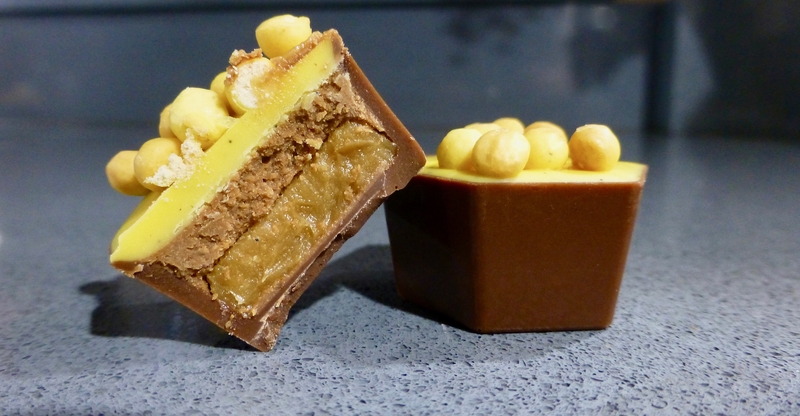 Last year we had the Hotel Chocolat Treacle Tart, which in its entirety was pretty good, however it is now the turn of a banana classic, enter Hotel Chocolat Banoffee Pie. Of the two I have tried this is the one I was most excited about because of the banana element. Typically getting the banana flavour right is a tricky business, it is either weak as a kitten or like you are eating a foam banana sweet (albeit I do love them too). Similar to the last ones these six hexagon shaped chocolates are nestled in a wavy plastic container and come in at the standard £3.95 a pack. Look at those layers! If that doesn’t scream eat me I don’t know what will. Brilliantly yellow these looked and smelled inviting. The milk chocolate wasn’t too thick which really allowed the other elements to shine. The banana milk mousse was delightfully bananary, and the sticky toffee sauce was thick, buttery, sweet and is of course the perfect accompaniment to banana. Aside from the different consistency of the layers there were varying textures from the chopped up banana flakes and shortbread biscuits, there is certainly a lot packed into one chocolate. 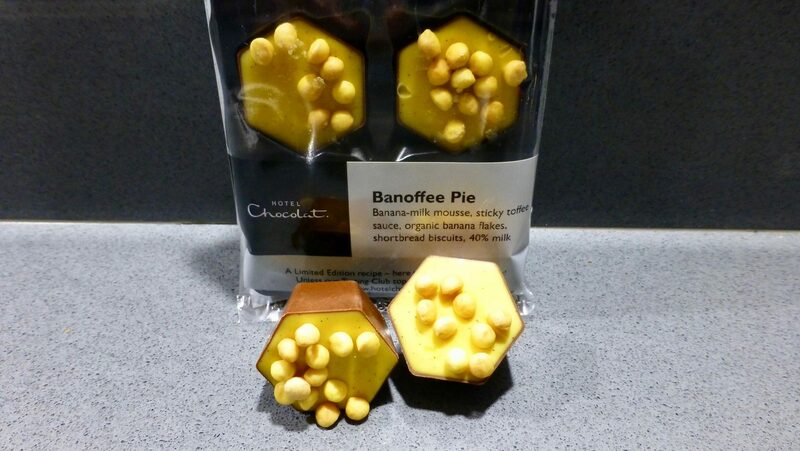 Oh Hotel Chocolat Banoffee Pie it is a thumbs up from me. This is more in homage to the classic dessert than the Treacle Tart version and is certainly my favourite out the two. Banana lovers are going to love this, so what are you waiting for, give it a try. What’s your favourite from Hotel Chocolate?